This is the most beautiful island I’ve ever been. 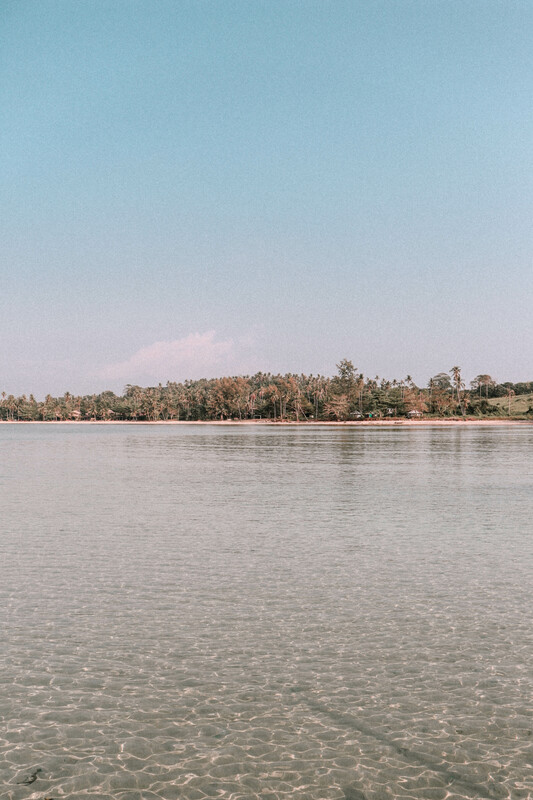 So peaceful, there’re many beautiful beaches with crystal clear waters, lot’s of nice spots where you can enjoy fresh traditional seafood meals and also amazing spots to watch sunsets. As you know I love sunsets, they’re my favorite time of the day, so I really enjoy watching them from all around the world. So for me Koh Mak is one of the places on Earth with the most beautiful sunsets I’ve ever seen. 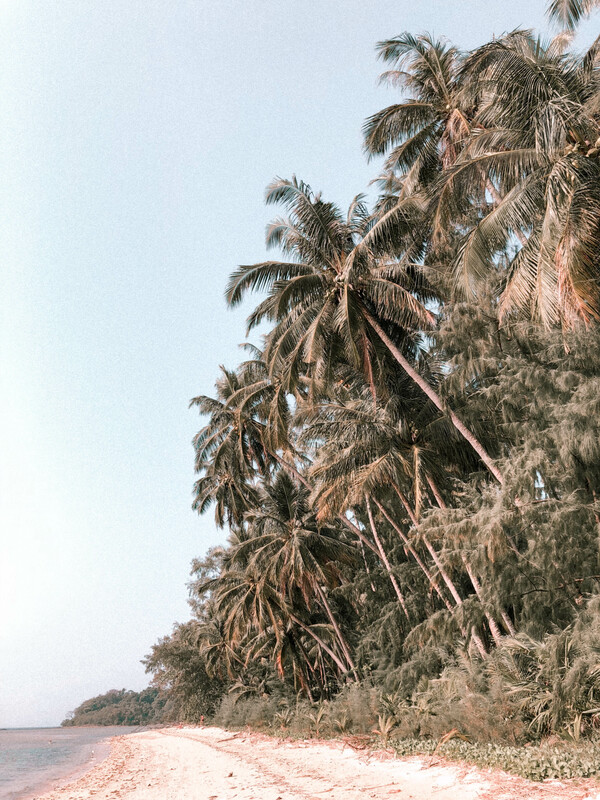 The island is still non-touristic, so I’m really happy that we skiped Phuket and Phi-Phi to go straight to Koh Mak and I’m sure every single time when I go back to Thailand I would do that. I’ve never been to Phuket and Phi-Phi, but I’m pretty sure they don’t worth visiting more than this small virgin peaceful island far-far away from the crowds. So if you’re not for the parties and nightlife I recommend to go to this place. But How To Get To Koh Mak? It’s pretty easy to go there. We woke up early around 7 a.m. and took a taxi to the Bang-Bao Pier in Koh Chang. We took the wooden boat at 8 a.m. and arrived in 2 hours. Trust me, this isn’t the best way to go to Koh Mak. We found out later that with a speed boat you can take the distance for around 30 minutes, so next time we will definitely travel only with speed boat. But anyway it was pretty interesting and something new for us to sail with the wooden boat, but if you have sailing problems like seasickness you should definitely take the speed boat. 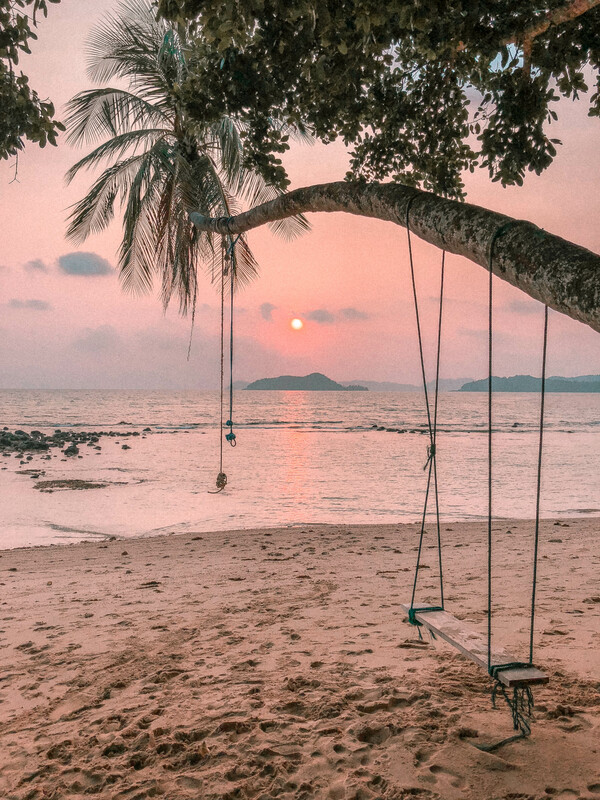 In internet I found some info that over 10 years ago, The “Sunday Times” chose Koh Mak as one of their Top Undiscovered Islands and just a couple of years ago the “New York Times” ran an article on finding “Old Thailand” on Koh Mak. The island is a relatively small, far more the typical desert island model than the mountainous Koh Chang. It lies approximately 20 kilometres south of Koh Chang and covers an area of 16 square kilometres. It’s roughly 10km wide and 5km from north to south. So it’s too big to walk around, but easy to see by bicycle or scooter. Source. 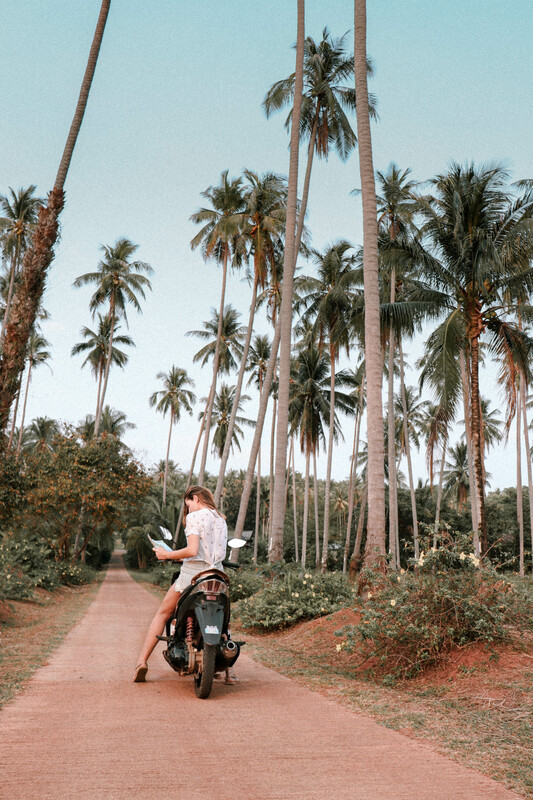 The best thing you can do while on the island is to rent a scooter, go to explore and get lost. So that was what we also did with my travel mate and bestie Masha. We rented a scooter on the same day we arrived and every single day we explored different beaches. And watched the sunset from a different spot each time. We’ve stayed at a nice place called “Monkey Island Resort” and I can totally recommend. There was also a nice bar at this place, of course called “Monkey Bar” where you can enjoy a cold refreshing drink at the evenings on the beach right in front of the sea and feeling the mild wind from the waves under the moonlight. It was magical really. The time has stopped during our stay here. . . I can tell that the time we spent on the island was the best time we had in Thailand. We really got the well deserved and wanted rest, we shot some yoga videos, we did lovely photos, that I’m gonna share with you next few days. Shooting an Yin Yoga Video at one of the most beautiful beaches I’ve ever been. So if you ask me will I come back. I will tell – DEFINITELY!!! I promise, next time I will rent some place for at least 2 weeks and then I will make sure also to take time to visit Koh Kood and maybe stay another 2 weeks there too. 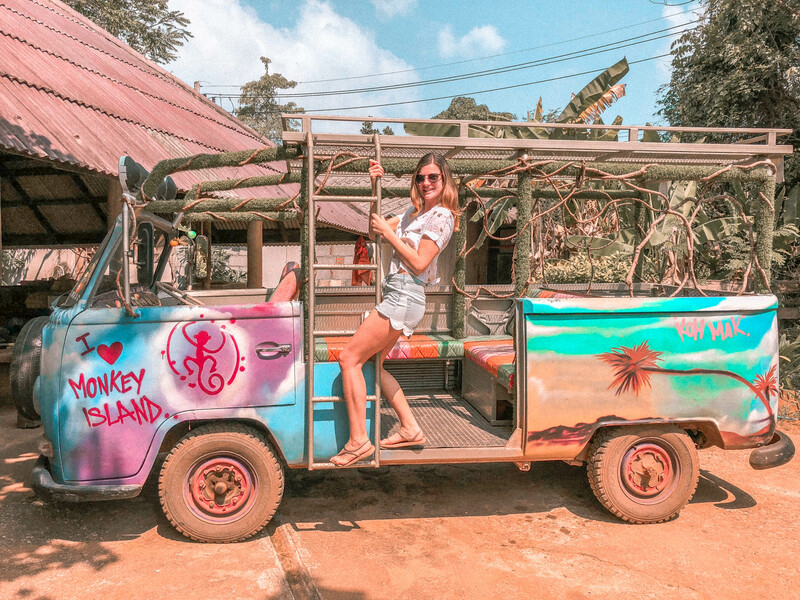 Koh Kood is the next island to the south of Koh Mak and I strongly believe it will be even better…Now, let’s come back to reality…We had a great time and sure we will come back!!! After our 6 days rest on the island we had to move to the next place of our adventure. We had a very lo-o-o-o-ong travel day from Koh Mak to Chiang Mai. Because we were about to explore the North of Thailand on the next week of our trip. I will tell you more about that in my next post, so stay tuned.